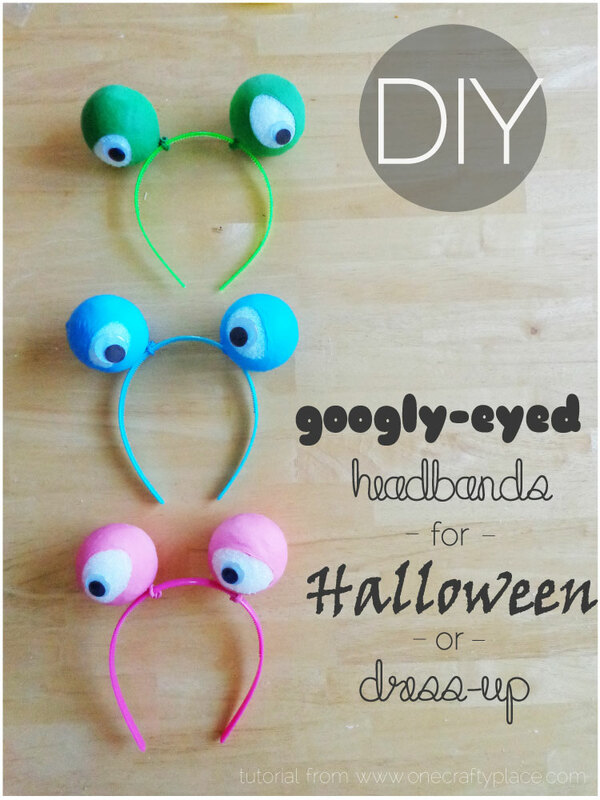 We’ve been getting Halloween costumes together around here and came up with some fun eyeballs for monsters or aliens. Neither of my girls are dressing up as monsters or aliens for Halloween, but they are having a ton of fun wearing these around the house.Â These are so quick and easy to pull together so if you need something quick, you could definitely pull together an alien costume at the last minute using these silly googly eyes! A few extra notes about the project: I used different width headbands on mine and found that the thicker widths (1/4″ maybe?) did a much better job at holding the eyes up steadily. However, if you want some super goofy wobbly eyeballs, then a thinner width would be perfect.Â Also, I made a pair (not shown) without craft eyes and just cut some black foam into circles, which I hot glued on, and those worked well also. I might not be back for a few days, so Happy Trick or Treating everyone!